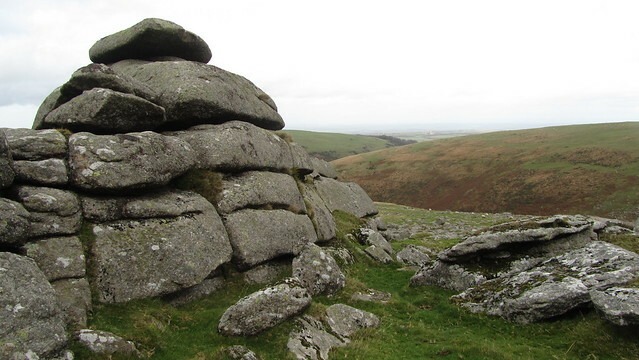 Up on the moor today, my goal was to make a collection of first visits and happy returns to some of the lesser tors on Bridestowe and Sourton Common Land, as well as sneak in a couple of my favourites on the way back to the car park at Meldon Reservoir. A fair few of the tors today were part of my ambitious plan of a fortnight past, where heavy clag curtailed any chance of success. In all honesty, even with a good day it would have been a tough ask simply because of the lack of daylight hours and the terrain encountered. 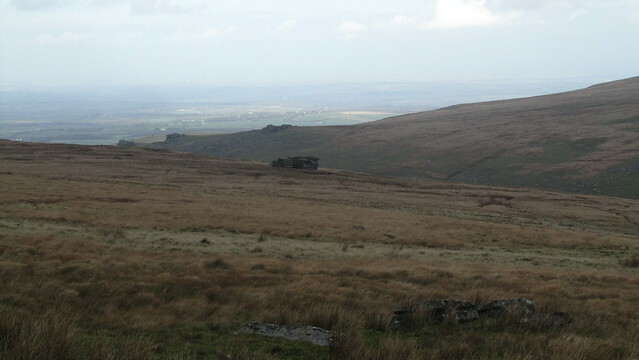 Today, there was no low cloud, and I started in hazy sunshine, out of the car park and through a gate onto South Down. 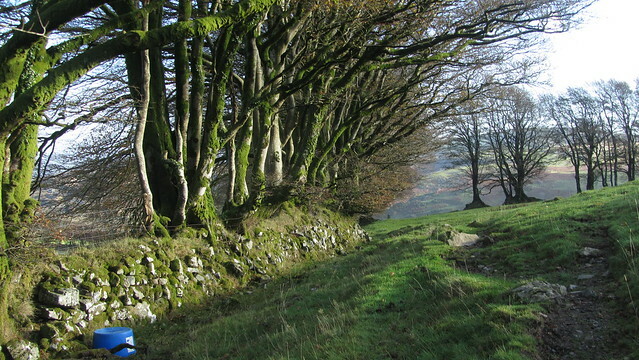 I passed along a bridleway hugging the wall of Higher Bowden, into a refreshing breeze. 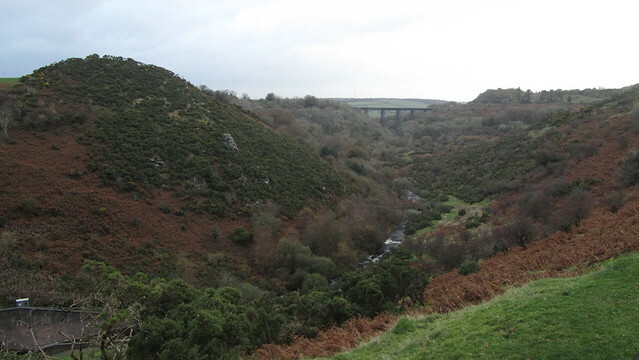 I was soon joining the West Devon Way and Two Castles Trail, which I then followed as far as the open moor. 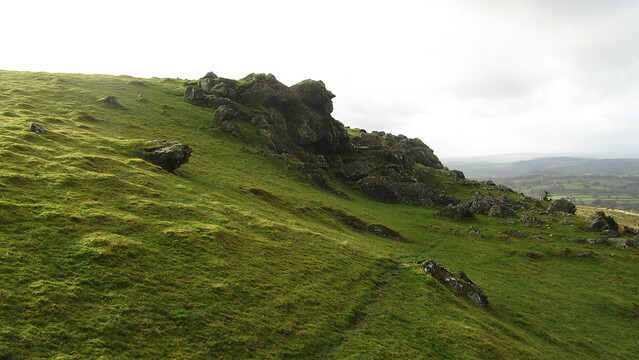 As I left the enclosed bridleway behind, I climbed a gentle gradient on good grass. 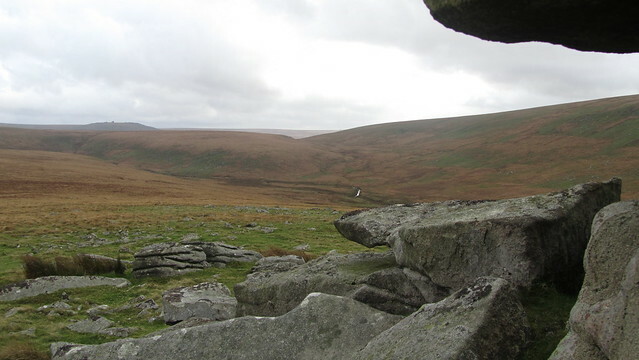 Instead of marching straight to the top of Sourton Tors, I went looking for East Tor, lower down and further south. 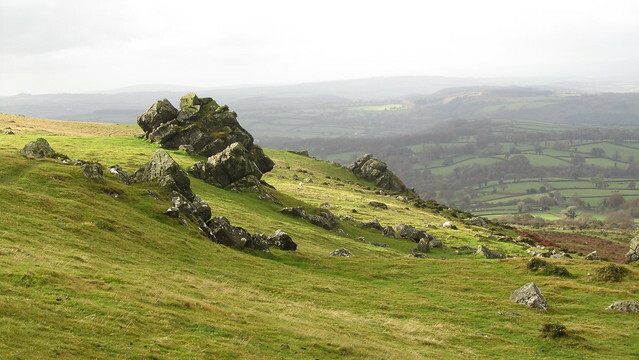 Sourton Tors is actually a collection of seven tors, all easily accessed and fun to explore and clamber around on. 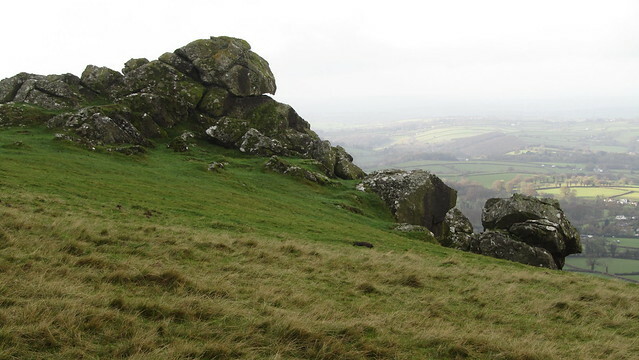 The lower outcrops possess views of the West Devon countryside on the edge of the national park, and in good visibility, you can see as far as the Cornish coast. 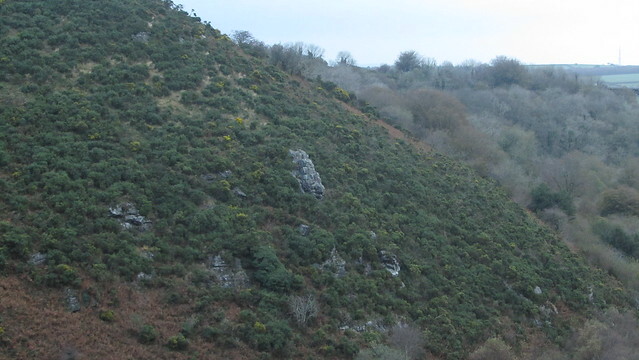 As I wandered between the dolerite rock, my imagination ran away with me and I spotted the profile of an old crooked nosed witch, and further on a thick browed man, both staring west to the setting sun. 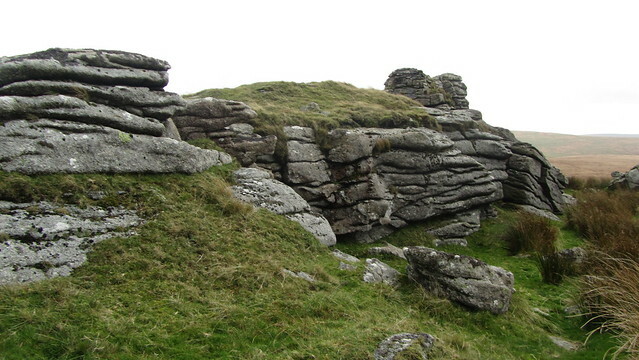 The witch of Sourton Tors? 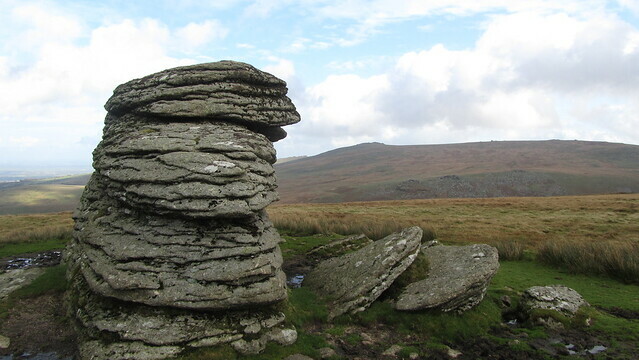 Heading further south, passed more exposed rock, I finally reached East Tor, the furthest outcrop, and strangely not labelled as part of Sourton Tors. 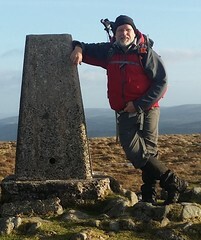 Now, with the lower levels explored, it was time to head into the moor, climbing higher to the pink trig point on the summit of Sourton Tors. 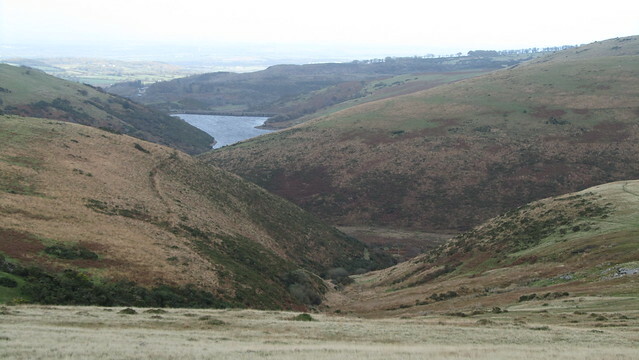 Looking north, a view of South Down and the blue of Meldon Reservoir, whilst north-east, the High Willhays Ridge; the roof of Devon. It is in the direction of the ridge that I set off, skirting around the large high mass of Corn Ridge on my right, and Vellake Corner to my left. 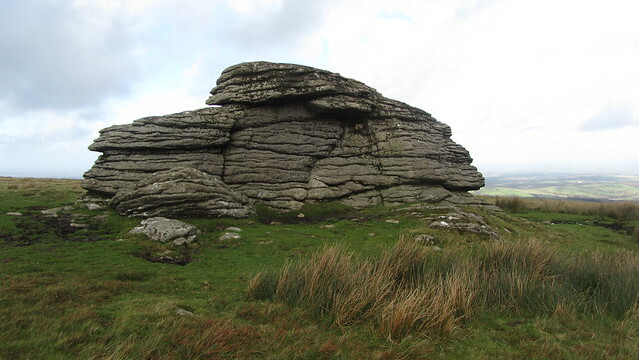 I was soon making my way into the sheltered bowl of Corn Hole, where Shelstone Tor sat before me, possessing a wonderful view of the West Okement valley on its opposite side. 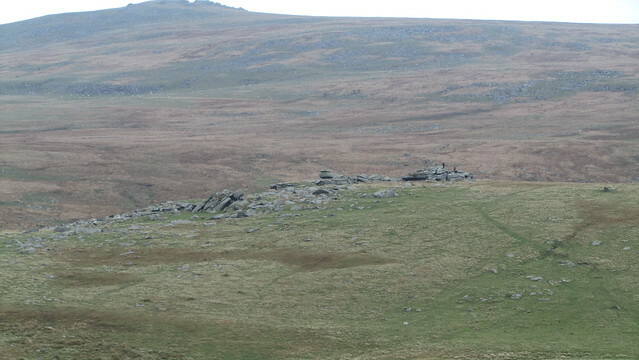 Up onto Shelstone Tor, I have marked this for a summer wild camp. I have noticed, on another visit, that the sheltered edge, away from the biting south-westerly squalls, can be a little wet so it will need to be in good weather conditions. 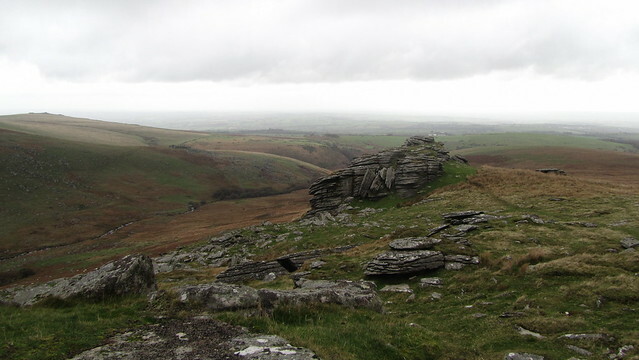 I do love this valley, and for a wild camp, Shelstone Tor is in a prime location. 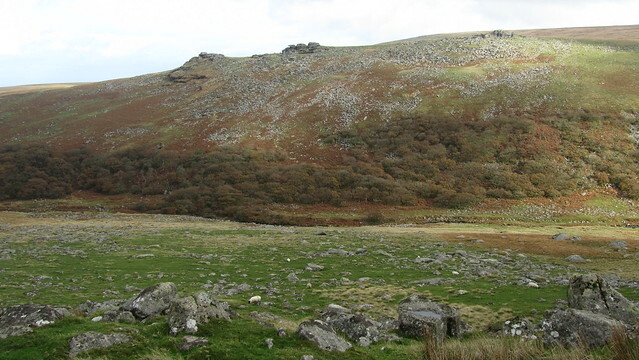 On the opposite bank lay the ancient alpine oak woodland of Black-a-tor Copse (also a good wild camp) now turning autumnal shades of orange and brown, whilst Black Tor stands guard high above. Next, I went in search of Slipper Stones. 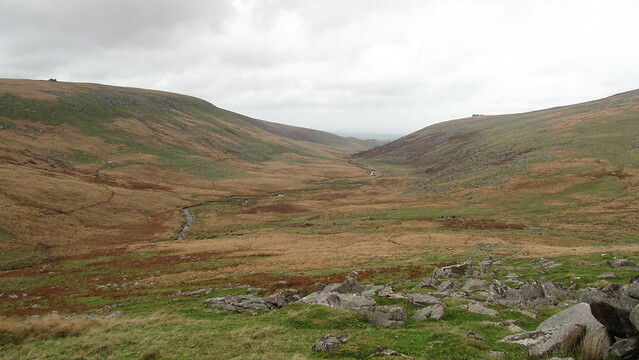 I had hoped that they may lie at the same elevation as Shelstone, but, sadly, it called for some nimble footwork on a descent along the steep side of Corn Ridge. I wasn't expecting much of these rocks, if I am honest. It resembles little more than a pile of clitter, but when you take into account there is no tor in the vicinity, you realise they do seem out of place. 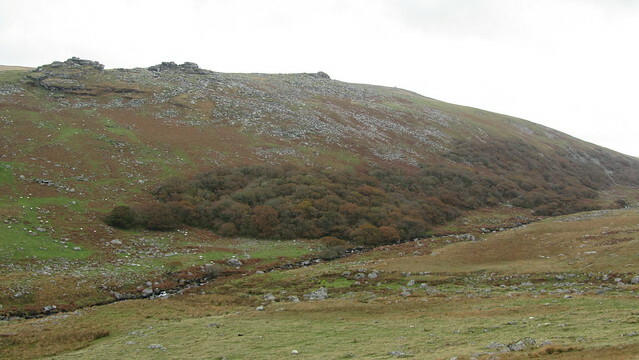 The evidence suggests that this line of granite is a glacial moraine, the remnants of the huge body of ice that carved out the West Okement valley, and was unceremoniously dumped here when the glacier melted. Whatever the reason for its existence, it was worthy of a short break. I sat for a while, out of the wind that was increasing on higher ground, admiring the oak woodland opposite. 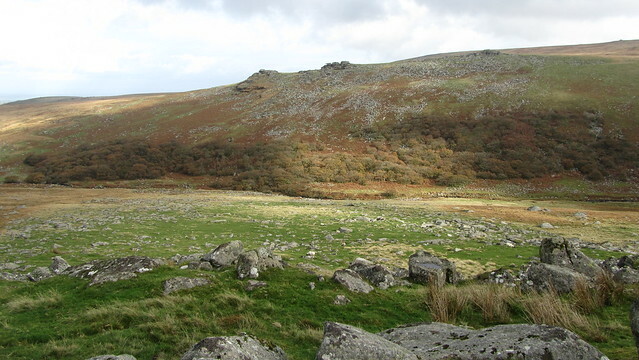 If you are interested in visiting Black-a-tor Copse, the easiest approach to it is from Meldon Reservoir car park, following the track below Longstone and Homerton Hill, to Vellake Corner, and then ascending the left bank of the West Okement on wide track to a walled section of woodland called "Island of Rocks". Continue left, along the wall, over some boggy ground and you reach a more stable section of flat grass that makes for good wild camping on the edge of the copse. Now I had to work out a way up the steep hillside, preferably without retracing my steps. 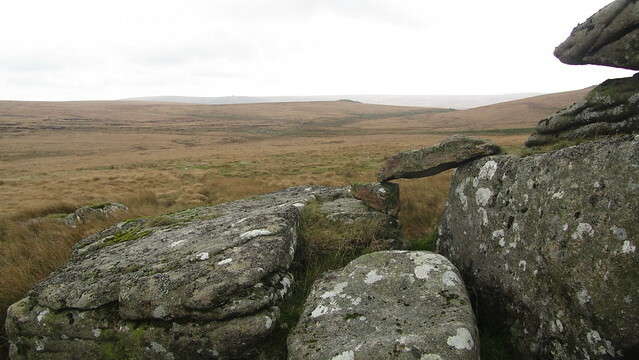 I kept higher, gradually making my way back towards Shelstone Tor, occasionally stopping to assess my route, take a breather, and take the opportunity to turn and look back at Slipper Stones and the valley; Beautiful! I picked my way, successfully, up onto less hazardous footing, and spotted the lonely granite lump known as Branscombe's Loaf. 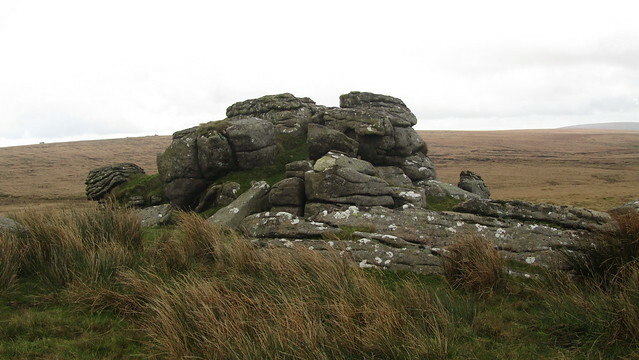 Whilst the name of this tor likely originates from Walter Branscombe, the Bishop of Exeter, it has its myths and Legendary Dartmoor recalls a tale of an encounter with the devil at this spot, which, is entertaining if nothing else! 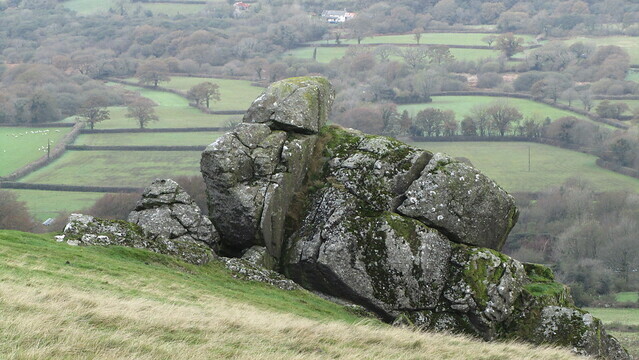 Close by there sits a much lower slab of exposed rock, which is often referred to as "The Cheese". 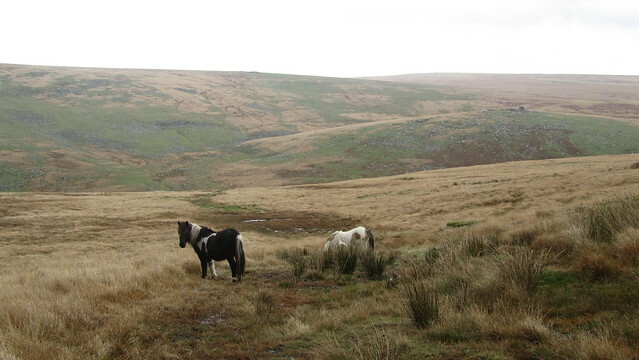 Now on Corn Ridge, I picked my way over saturated ground, bound for Gren Tor. As I dropped slightly to cross the River Lyd close to its head, a sign post caught my eye about 30 metres to my left, by a patch of exposed peat. Worth a detour, I figured! 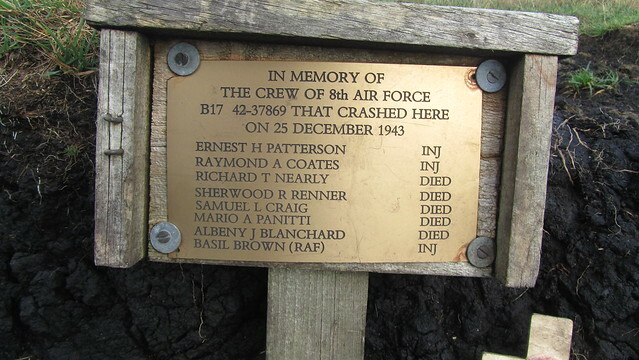 I had happened across the crash site of a B17, that went down here on Christmas Day in 1943. Five died in the accident, three injured, but survived. 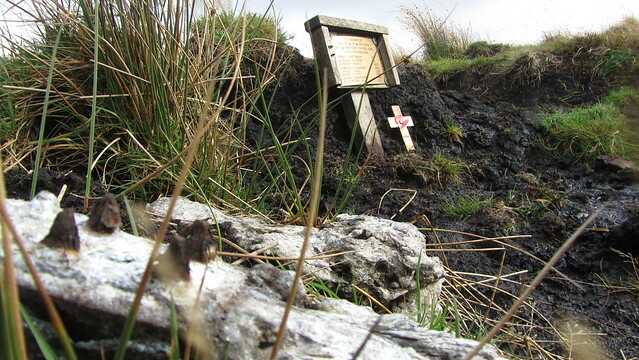 Scattered about this waterlogged black scar of bog, are the fragments of the plane, alongside the memorial plaque, serving as a reminder of the tragic accident. 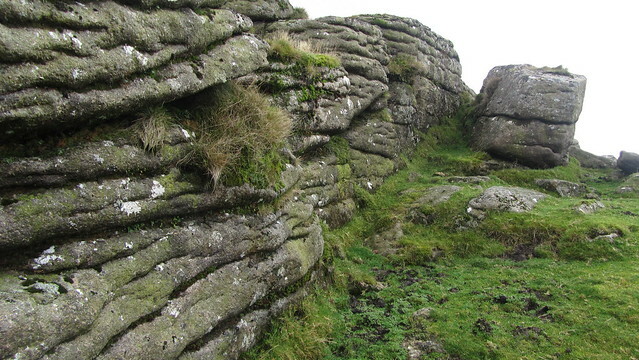 I crossed the River Lyd, and happened upon the remnants of a track that helped the approach to Gren Tor. 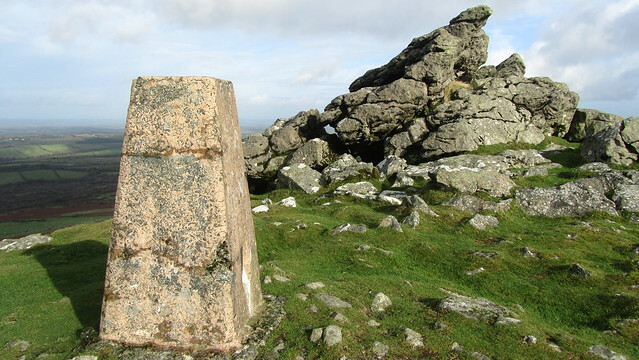 By now, the wind speed had increased and I took refuge behind the granite while I dragged out my Paramo jacket for the first time on the walk. It wouldn't be taken off for the rest of the day. 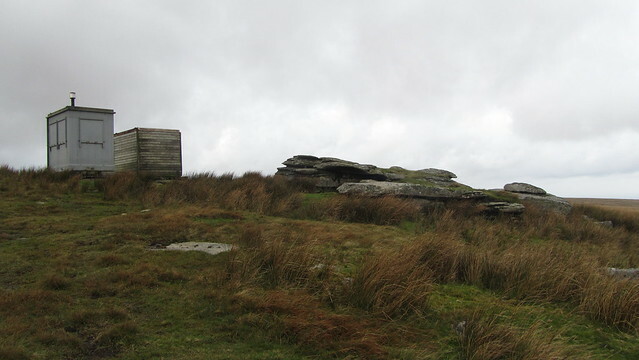 The track to Gren Tor continued, up Woodcock Hill, to Hunt Tor. 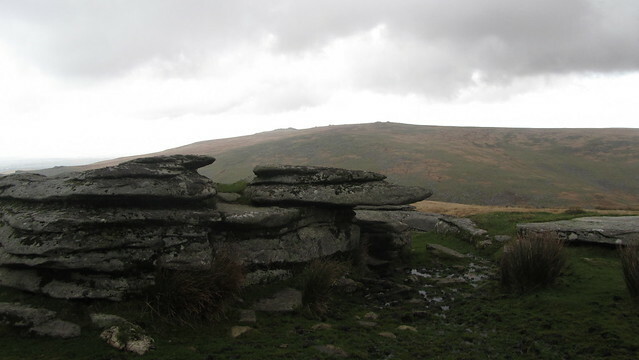 I briefly visited the top, but the winds were buffeting me, and it was proving difficult to stand firm in its path. The same track deviated around the worst of the Rattlebrook Head, but still it required meandering either side to avoid the worst of the sticky peat. 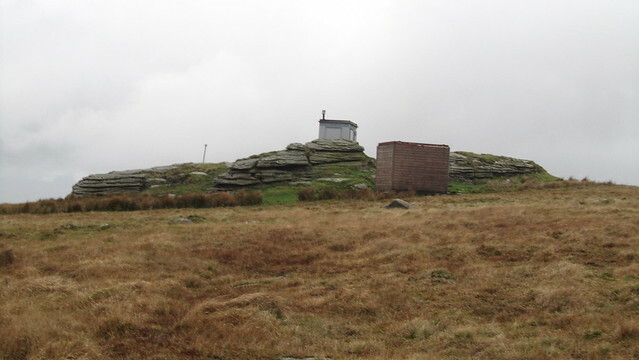 I reached Amicombe Hill and Kitty Tor, where I had hoped to take a break, but even the army huts on its top failed to provide a comfortable place to perch. Better options in the valley, I wagered. 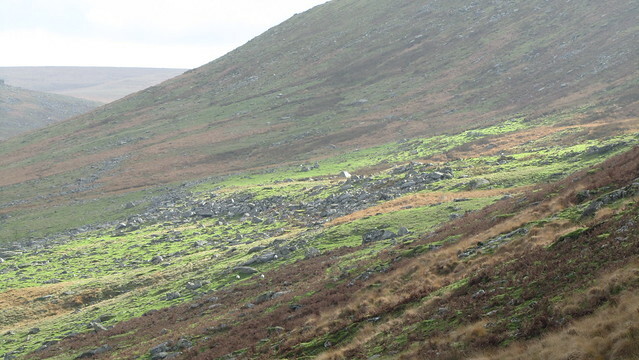 On my descent, I considered the soggy trudge over to Steng-a-Tor, but I've bagged this forest boundary point a few times, and I know, all too well, the ankle traps descending from that point. So, I decided to give it a miss, and take the safer option down to Sandy Ford. 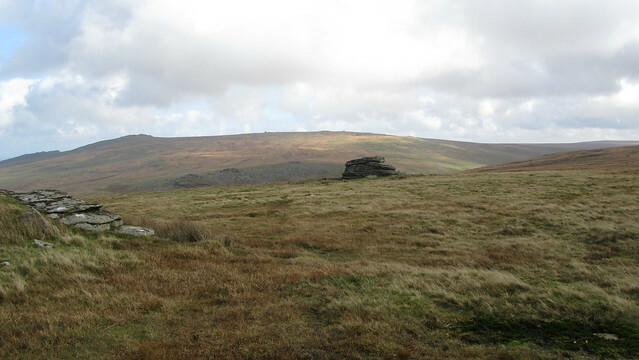 Descending Amicombe Hill to Sandy Ford, with Lints Tor to the right. 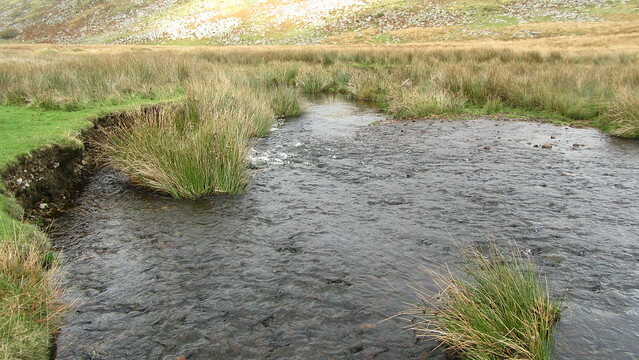 Despite the green algae coating the stones below the surface of the water, Sandy Ford was a shallow and easy crossing. 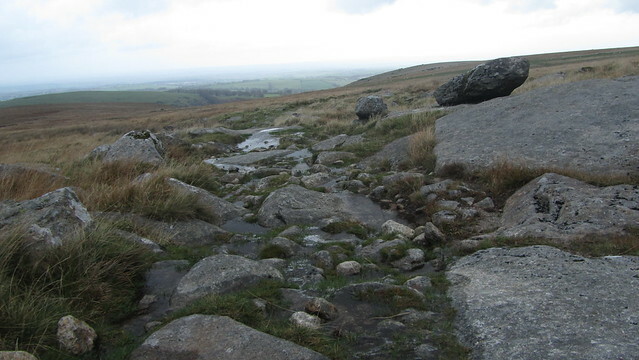 There were a couple of small streams to hop across on my ascent up to Lints Tor. This was, to my shame, my first trip to this tower in the centre of the valley, when you consider my multiple visits to the area. 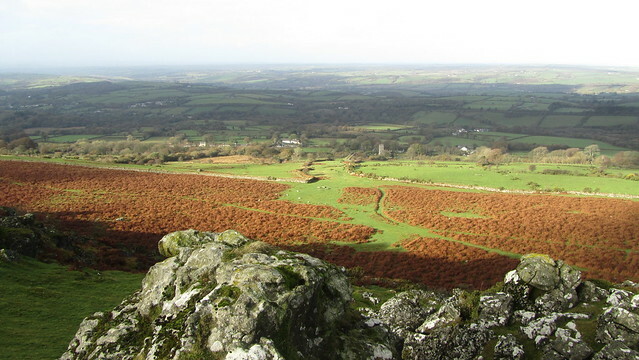 Halfway up, I turned to admire the West Okement snaking its way down to Black-a-tor Copse, and the reservoir beyond. On top, the wind cut straight across me, and it was all I could do to hold my camera out and take a photo of the tower. 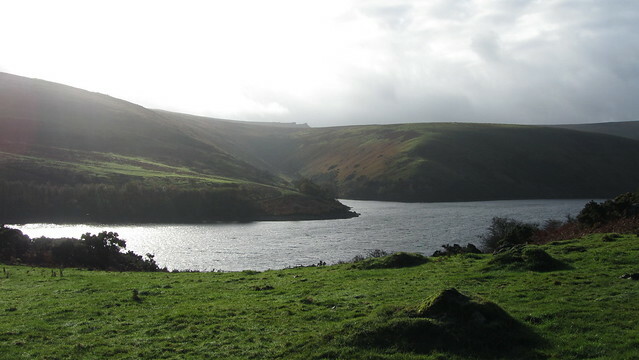 As I went to get out of the wind, the small hollow on its north side was already full with four walkers having a brew. They were there a few more minutes, before setting off in the direction of Great Kneeset to find a crossing that would allow them to make their way back to the Fox and Hounds, where they were camped; almost as far to go for them, as it was for me, in the other direction. I saw Dinger Tor sat on the hill to the north. A straight line for the tor meant a drop down into a small valley, across a stream, and some seriously eroded ground, hidden among the tall grass. 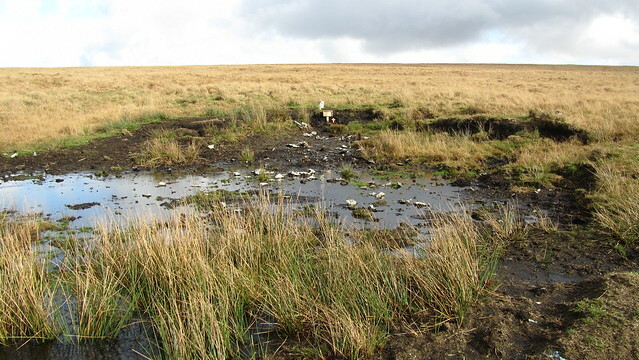 If downloading my gpx file to attempt this walk, I urge that you take extra care here, as I spotted crevasses in the peat that would take you at least to your waist! When I reached Dinger Tor, time was running out for me. 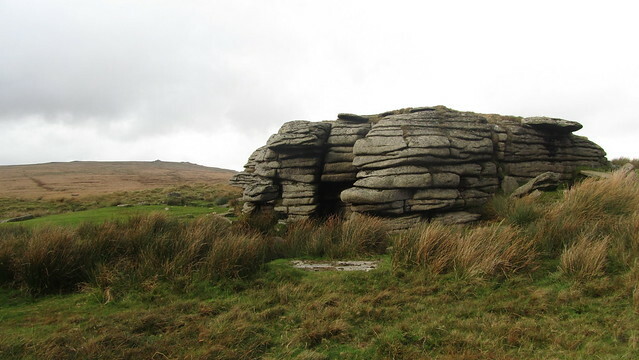 Heading over to Okement Hill, East Mill Tor, Curtery Clitters, and Little Tor would see me home well after dark. 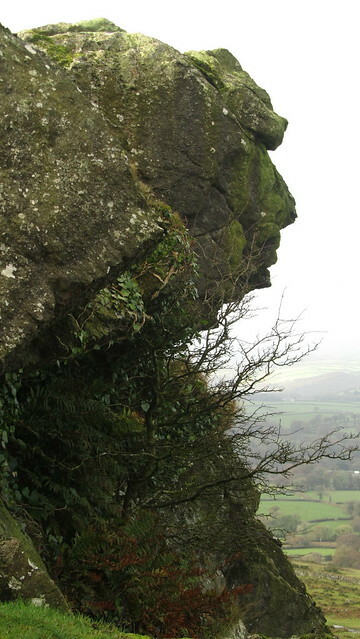 Instead, I hoisted up the hood of my jacket, pulled the cord tight and turned for Fordsland Ledge. It was one of those moments when the destination is in sight, but it never appears to get closer. 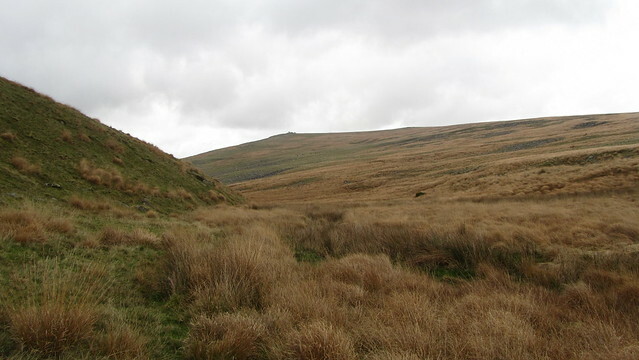 I followed a succession of tracks that appeared and disappeared in the tussocky grass, but all in the general direction of the army observation point that dominates this tor. When I finally reached it, I text "base camp" to let my mum know my original estimate of getting back would be missed, and that I would be another hour and a half. It was all downhill now though! 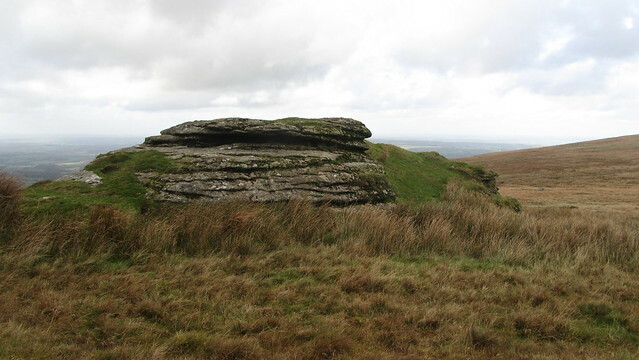 My route took me down along the three outcrops of Black Tor, where I was to pick up the very rough track back to the reservoir, via Longstone Hill. A herd of cattle watched me, seemingly puzzled as to why anyone in their right mind would be out in this wind. I gave them a very wide berth. I always seem to be taking this track at the end of a walk in this area, when my feet are at their most fragile. 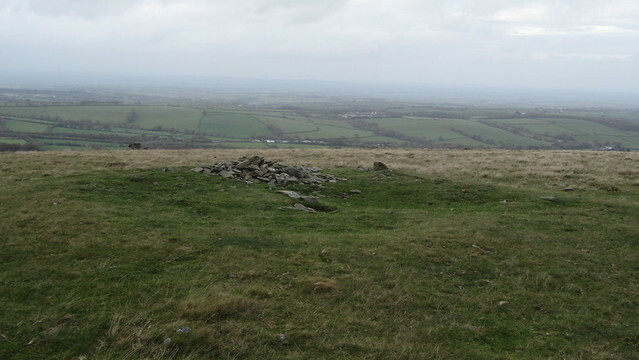 It is always a joy to reach Longstone Hill and the more forgiving grassy descent. 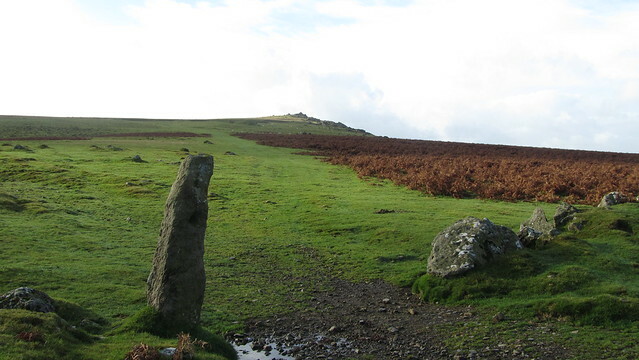 The name Longstone Hill would suggest a menhir that sits high above Meldon Reservoir, and its gorge. 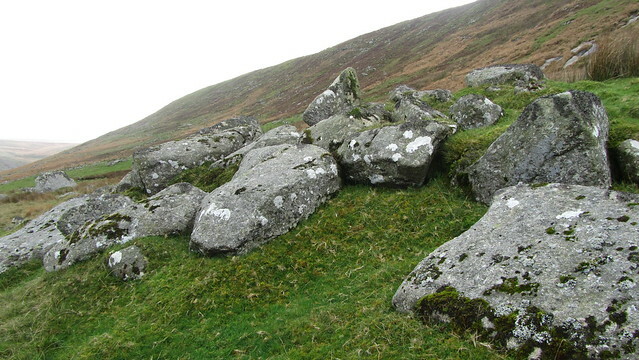 However, there is no evidence of one, and all I have seen is a small untidy cairn just off its summit. 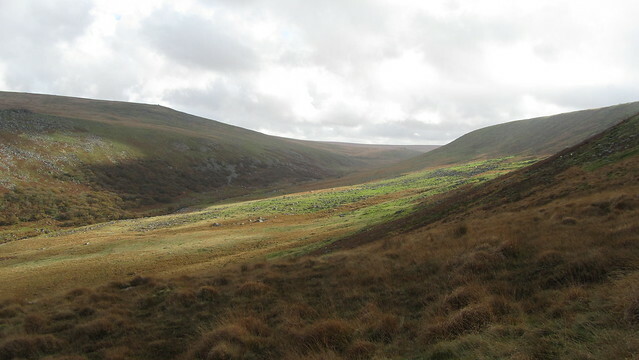 As the track turns around the hill you are afforded a view of Red-a-ven Brook, dropping down towards the West Okement; each time I see this valley, I resolve to make the effort to explore it one day. 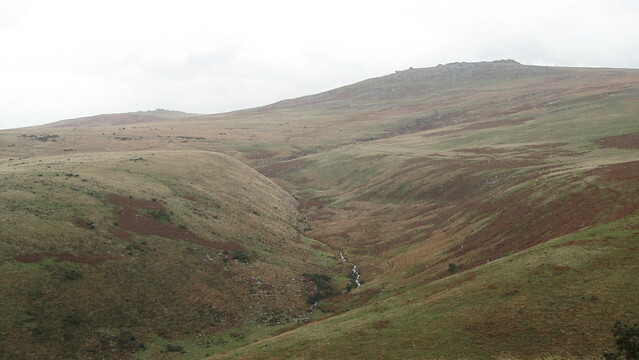 I took a look through Crossing's Guide to Dartmoor and found no reference to it, but instead a description of the route Crossing took up Meldon Gorge and the West Okement River, to Corn Ridge. It is sadly different to what we see today. 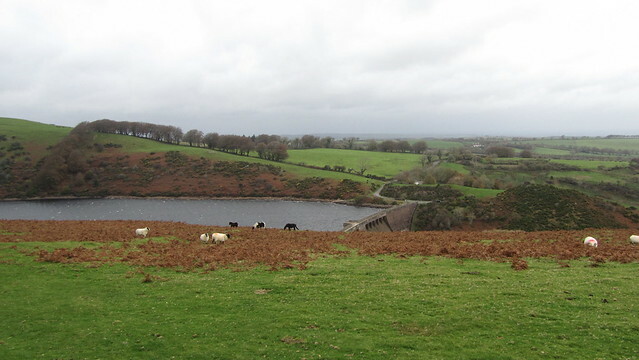 With a water shortage in Devon, the building of Meldon Reservoir, completed in 1972, saw the section below Longstone and Homerton Hills flooded up to Vellake Corner. 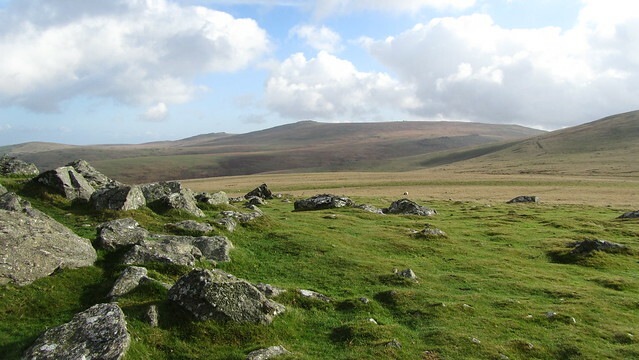 It is a loss to Dartmoor; what I wouldn't give to have seen it in all its glory! I wandered back into the car park by 4:15pm, my days ramblings complete. Very satisfied with the 21 plus kilometres over some pretty inhospitable terrain. 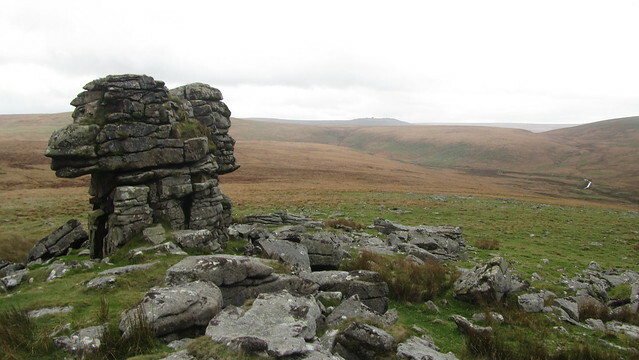 With a few Social Hikers meeting up with me on Dartmoor on the weekend of the 14th, I felt I needed a good hill day to build up my stamina!